Happy Valentine's Day! Whether you're single or attached, I hope you're spending today anywhere other than a sad little mining town in Canada. My Bloody Valentine takes place in just such a backwater, haunted by the specter of its dark past. The story goes: 20 years ago, while the townspeople twisted away at the Valentine's Day Dance, a terrible mine accident trapped 5 men underground. After a rescue effort that took several weeks, they pulled one survivor from the dark: Harry Warden. Having resorted to cannibalism, Warden was now deeply insane. A year quietly passed. Then, on the next Valentine's Day, Harry Warden returned to murder the two supervisors responsible for the accident with a pick ax. He left their hearts in heart-shaped chocolate boxes with notes warning the town never to have a Valentine's Day Dance again! For 20 years, the warning had been heeded. That is, until now. The dance is back on, and it seems Harry has returned. Hearts and bodies pop up everywhere as the sheriff and mayor deal with the crisis. A group of young people (the men work in the mine, the women.... put up Valentine's Day decorations) are insistent that the Valentine's Day Dance go ahead. When the sheriff cancels it, they plan to break into the rec-area of the mine and hold it anyways. By the end, the body count is growing, and the remaining characters are left to race through the mines, running from the gas-masked madman. With a title like My Bloody Valentine, one would expect this to be a slasher schlock-fest complete with terrible music, college-girls in bras, and plenty of gratuitous violence. I'm not gonna say My Bloody Valentine LACKS those things, but it does manage to conduct itself without ever falling deep into the pit of Bad Movie-dom. If you go into My Bloody Valentine expecting art, you will be disappointed. If you go in expecting a fun horror movie, you will be rewarded with chocolate. The pacing is perfect. Dread is accomplished quickly and succinctly, particularly in the first-person stalking scenes. Storytelling is a thing this movie does at all, which in turn means that we get definition on the many characters. And it does so without forcing us to watch the actors exchange terrible, blunt, tired lines of dialogue about their backstories that are so bleakly generic that they might as well have been making seal-sounds (or perhaps my angst about the remake is bleeding in here- Orp, orp,orp!). Speaking of characters, from the sheriff to the twenty-somethings, the players are distinct enough to keep straight, and some are even lovable. For example, Hollis, a bearlike, mustached guy who is actually responsible, yet also a pretty cool dude in a committed, caring relationship with his lady. Of course, there's plenty of sexism and a love triangle, but near the end these problems begin to shift in subtle ways. The two guys fighting over a girl completely put aside their differences to make sure everyone gets out of the mine alive. Relationships are sometimes portrayed as... actual relationships that include things other than banging. The authority figures do things authority figures would, which includes not telling the youngsters jackshit. Also, there's a deeply sad moment involving the sheriff and a box of chocolates that hints at how the adults are also leading their own complicated and emotional lives. Then, we get to my favorite part: the makeup and practical effects. My Bloody Valentine comes off as a bit coy when it comes to gore. This may have been because the MPAA cut 9 minutes of "gore" from the feature before its release. But whatever the cause, the effect is that we don't have to spend long stretches of time staring as a person gurgles. In fact, we frequently only get glimpses of the kills, reminiscent of the man who got his eyes pecked out by finches in The Birds (only not quite as classy). However, when we do get a look at the gore, it's very well-done. There's no "Here, let me wet toilet-paper and stick it to your face, then over-use my stippling sponge- HOLD STILL" in this movie. It's as if the make-up department actually bothered to look up the difference between someone who gets third degree burns from boiling water, and someone who gets burns from being left in an industrial dryer overnight. Of course, there's plenty about My Bloody Valentine that evokes giggles rather than gasps. The villain is distinctly Darth Vader-y. The opening scene is basically all you ever need to know about a slasher movie ever- it's so cliche that it's like a warm hug from a teddy-bear. The twist-ending is visible from a mile away, and the plot plays it by the book. But what made me enjoy My Bloody Valentine is how right it gets it. All the genetic markers for slasher movies are here, and done very well. In my opinion, the thing that makes a good slasher movie is not how scary it is, but rather the chord it strikes. Slasher-movies ought to be a thrilling admixture of schadenfruede, creepiness. laughs, and investment in the characters. They're the campfire stories about hooks on cardoors. Their purpose is to compel teenagers to clutch each other, then chuckle awkwardly, not stay with those teens until 3 o'clock staring at the ceiling. 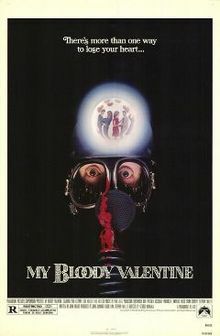 Thus, with this being my personal rubric for slasher-flicks, I think My Bloody Valentine is a good one. Perhaps not the greatest of all time, but a solid entry.